What can be said about this author that hasn’t been said before? Prolific. Scary. Master of terror. King is all of these and more. King has really grown as not just a writer of horror throughout his career but as a true wordsmith, a master of his art and none more so than with this latest offering. Moving away from the horror genre somewhat to that of crime/thriller King has written a fantastic novel that will appeal to old and new fans alike. It has the power to entrance readers who have never read his works before, and anybody who sees him just as a horror hack will be proved wrong if they give this a try. There were parts of this novel that were typical horror, parts that made you want to cry with sadness. Running through the book the theme many of us will recognise. Losing our first love. King in recent years has really excelled in the work he has produced, this novel is no exception. 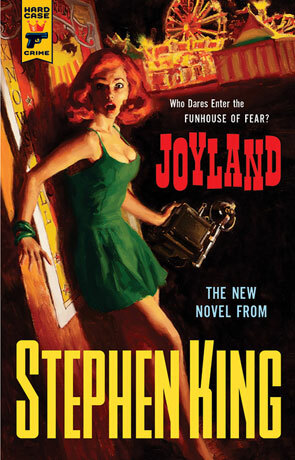 It tells the story of Dev and some friends who come to Joyland to work through the summer vacation, earning money to help pay their way through college. Whilst there they learn of a local girl who was murdered in the haunted house ride. Determined to do something the police couldn’t and identify the killer they begin to piece together any information they can. Dev though has concerns of his own. A girlfriend who is always too busy to talk to him, and the realisation he is losing her, (but not his virginity, no matter how hard he tried with her). The little crippled boy who so wants to befriend him if it wasn’t for the stern looks of his mother that kept Dev away. The demands of the job. Dev maybe not be exactly carny from carny but he was the next best thing as far as Howie was concerned. A truly fantastic read. I couldn’t put it down at all. This is a novel that may not change your life but damn if it doesn’t pull it along on a fantastic path for a while. Written on 10th June 2013 by Arron.